Like the nation and the world, the eighteenth-century church community in the Boothbay region has experienced enormous change over the past 250 years. This history explores that change, enshrining in particular the role of human actors in the long historical drama, those “lively stones” who undergird this religious institution’s long growth and development. 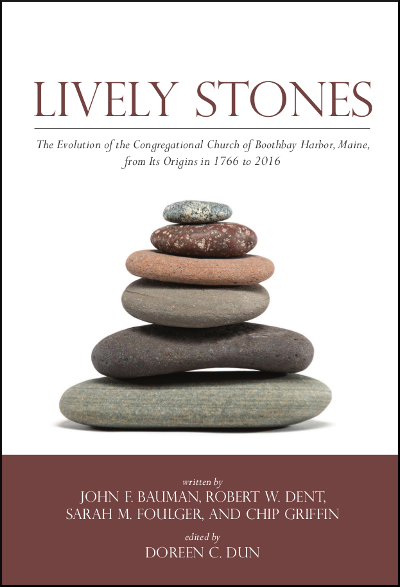 The “lively stones” theme that continues to inspire the people of the Congregational Church of Boothbay Harbor in 2016 emerges chapter by chapter in descriptions of people whose faith, fortitude, and wisdom have enabled the church to endure and over 250 years to prosper, despite multiple challenges to its survival.